San Diego Mayor Kevin Faulconer and City Councilwoman Lorie Zapf announced Wednesday that construction will begin in July on a major expansion of the West Mission Bay Bridge. The bridge is one of the city’s busiest thoroughfares to and from neighborhoods in Pacific Beach and Mission Beach. The $110 million project will replace the existing four-lane bridge with two separate three-lane structures. A protected bike path will be added to both bridges, and roadways along Sports Arena Boulevard, West Mission Bay Drive and the westbound I-8 off-ramp will be widened. In all, the project should improve vehicle, bike and pedestrian transportation across the San Diego River. 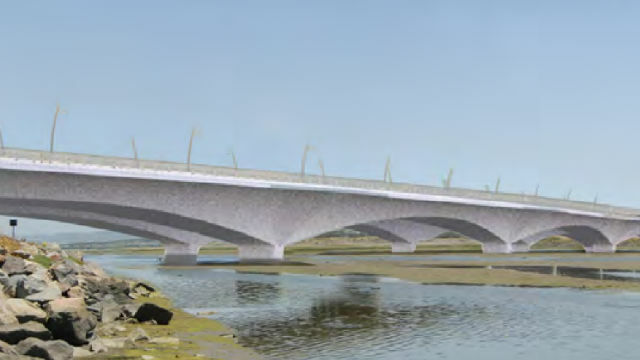 A “unique construction method” will be used to avoid interrupting traffic along the existing bridge, according to the city. A temporary construction bridge will be built next to the northbound side of the bridge, which will hold the construction equipment needed to build the new three-lane northbound structure. Crews will place structural supports into the ground between the existing bridge and temporary construction bridge, then build the new bridge roadway on top of the supports. Once the northbound bridge is completed, the temporary bridge will be removed from the northbound side, and rebuilt along the southbound side to repeat the process. Project funding comes from a handful of sources, including $91.5 million from the Federal Highway Administration, $4.9 million from a SeaWorld traffic mitigation fund and $13.5 million from a Transnet Extension fee. The West Mission Bay Drive Bridge was constructed in the early 1950s. Because daily traffic exceeds the bridge’s current capacity, Caltrans has classified the structure as functionally obsolete.